What do you need to tell a story? What’s the bare minimum? I’m not talking about the guerrilla attitude of a bootstrapped production, but rather the final images that play out on screen before your audience. How far could you strip things back and still deliver an intelligible and entertaining film? Beautiful in its simplicity, Sonja Rohleder’s award winning animation Walk the Dog (Dame mit Hund) wholeheartedly embraces this idea of minimal visual storytelling. 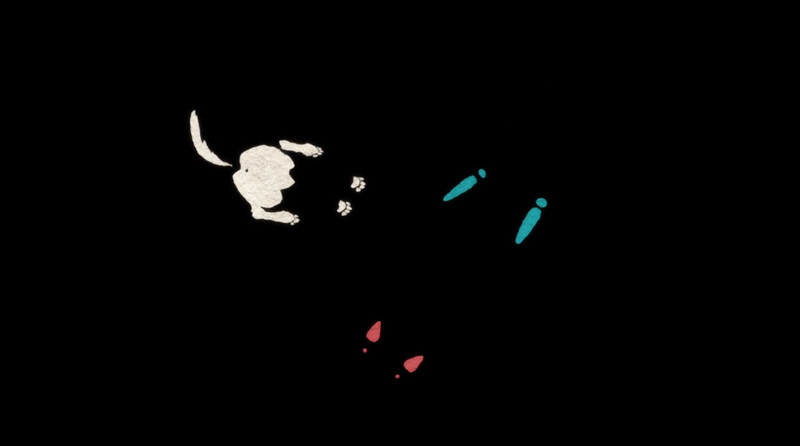 Presenting a mostly black screen populated with a sparse series of colourful footprints and graphics, the three minute short tells the charming story of a woman’s walk with her unruly dog in the park being interrupted by an unwelcome acquaintance. Sonja tells DN how a lack of funding freed her to experiment with an abstract, cloze text style of filmmaking. Dame mit Hund (Walk the Dog) is my first independent short film after film school. I had a tiny grant due to the success of my graduation film Cocoon Child, but it was not even close to what I would need to work on a film for 2 or 3 years, which was the average time most of the animators needed for their films. I was too involved in commissioned projects to seek further founding options, BUT this funding gave complete creative freedom to me. They wanted me to make a film but didn’t care about the subject or execution. A perfect time to experiment. I don’t have a note book with ideas. I only gather ideas at the very moment of creation because they are constantly ageing. Animation on the other hand takes a lot of passion and effort. I need that to work at my full capacity so I rather work with what interests me at the moment. In 2013 I was really into the abstract animated films by Oskar Fischinger (Study Nr. 2, 1929) and Walter Ruttmann (Opus, 1921). To achieve a cinematic experience with just abstract forms and music with a rather timeless design, was very refreshing to me. On the other hand, some members of my studio worked on very complicated animation: 3D, stereoscopic images, motion captured camera work and photorealistic rendering. All the good stuff. The perfect image. I admire those projects but compared to the abstract film I watched at that time, I wondered if there was a different kind of filmmaking for me. I wanted to work alone or in a small team for this project and experiment. There is something that I’m afraid of when it comes to film making. I call this “Kotzgrenze” (vomiting border). I believe in the theory that there is a healthy amount of time in which an animator should finish a film. My old professor and hero Gil Alkabetz taught this to me. I witnessed some filmmakers crossing the “Kotzgrenze” after about 1 year and that was the point when they lost the excitement about the film and started to struggle. Their faces get pale and they start to refer to their film only after letting out a big sigh. Also I noticed that more time and budget doesn’t mean that the film will get better. In my case I knew that too much time on my hands doesn’t work to me. My projects tend to get more serious and uptight. I just think too much. So I had my boundaries for this film: a minimum of money, a minimum of time and the need for a doable timeless concept. Experiment and work fast! Use the instinct rather than the brain. Experiment and work fast! Use the instinct rather than the brain. I collected ideas and the 8th one was a world where one could only see what touches the ground. That made me smile and I was curious if it would actually work. I wanted to see where a minimal approach could lead. I started from there. The ‘character design phase’ was rather fast and I started to animated the footsteps in a straight ahead manner. When I finished the first draft I needed a sound design to show it to my test audience (my colleagues). Therefore I needed an expressive language in which people would flirt and fight. In our collection of films I found some of Fellini’s old movies and used bits and pieces as a layout sound. It worked well and the response to the vintage sound was so positive that I wanted to keep it. But the film itself didn’t work out as I planned. 50% liked it and the rest had no idea what happened. The experiment failed. So I kept the characters but restructured the story in order to make it more accessible. That was the second version and also the final one. I hired the very talented animator Veronica Solomon for the more complicated hand drawn animation to finalize the film. After that I worked with my favorite Sound Designer Michal Krajczok. I tried to get in contact with some Italians from the very south of Italy because I heard that there are accents that are so strong that only a few Italians would understand. That was exactly what I wanted. Nonsense but something with more elegance than the typical animation gibberish. But that didn’t work out. Those 3 Italians that I found did come from the very south but they are what I call the Italian refugees. Young people born in Italy that are frustrated by the governmental politics, the lack of opportunities in Italy and are longing for the fresh culture in Berlin. They were charming and nice and smart but they had no accent at all. I kept it anyway and asked Michal to “destroy” the clarity of the sound as much as possible. His work had a big impact on the film and I was very happy with the result. I love the genre of short films for giving us the possibility to really experiment with looks and ideas. That was it. The film was finished. It took me about 2 months in absolute working time but since I worked on it in between projects it was finished after a year. The main part was animated in After Effects and Veronica used TVPaint. The best moment with the film was for me to see it at a festival with a larger audience. It was amazing to hear that immediate reaction and laughter of people. I love the genre of short films for giving us the possibility to really experiment with looks and ideas. Right now I’m working on a new film concept. I hope that it will be as short and as fun in the making as this one was. Animation provides us with so many different options of filmmaking and I hope all of them will be used.